German Americans constitute the largest ethnic group in the US. Approximately 60 million Americans claimed German ancestry in the 2000 US Census, more than any other nationality. German American loyalty to America’s promise of freedom traces back to the Revolutionary War. Nevertheless, during World War II, the US government and many Americans viewed ethnic Germans and others of “enemy ancestry” as potentially dangerous, particularly recent immigrants. The Japanese American World War II experience is well known. Few, however, know of the European American World War II experience, particularly that of the German Americans and Latin Americans. We also have much to learn about the Japanese and Italian Latin American programs. The focus of this overview is the US resident German experience, however, the programs were applied to all of “enemy ancestry” with varying ramifications. (See internment of Germans from Latin America) (See related legal framework) The US government used many interrelated, constitutionally questionable methods to control those of enemy ancestry, including internment, individual and group exclusion from military zones, internee exchanges for Americans held in Germany, deportation, “alien enemy” registration requirements, travel restrictions and property confiscation. The human cost of these civil liberties violations was high. Families were disrupted, reputations destroyed, homes and belongings lost. Meanwhile, untold numbers of German Americans fought for freedom around the world, including their ancestral homelands. Some were the immediate relatives of those subject to oppressive restrictions on the home front. Pressured by the US, Latin American governments arrested at least 8500 German Latin Americans. An unknown number were sent directly to Germany, while 4050 were shipped in dark boat holds to the United States and interned. At least 2,650 US and Latin American resident immigrants of German ethnicity and their native-born children were later exchanged for Americans and Latin Americans held in Germany. Some allege that internees were captured to use as exchange bait. During World War II, our government had to do its utmost to ensure domestic security against dangerous elements in its midst. But it could have exercised greater vigilance to protect the liberties of those most vulnerable because of their ethnic ties to enemy nations. Some were dangerous, but too many were assumed guilty and never able to prove their innocence. Admittedly, US wartime governmental actions are difficult to assess decades later. To prevent possible future erosion of our civil liberties, however, the federal government must fully review and acknowledge its wartime civil liberties violations. A comprehensive federal review of the European American experience has never been done. On August 3, 2001, Senators Russell Feingold (D-WI) and Charles Grassley (R-IA) introduced The Wartime Treatment Study Act in the US Senate for the first time. This bill would have created a independent commission to review US government policies directed against European “enemy” ethnic groups during World War II in the US and Latin America. This commission would have also reviewed the US government’s denial of asylum to European (primarily Jewish) refugees seeking refuge in the US from persecution in Europe. The bill was most recently reintroduced in March 2009, however it was not acted on. Read More on Legislative Efforts. The following summarizes two methods of control: internment and exclusion. A timeline of relevant events follows. Pursuant to the Alien Enemies Act of 1798 (50 USC 21-24), which remains in effect today, the US may apprehend, intern and otherwise restrict the freedom of “alien enemies” upon declaration of war or actual, attempted or threatened invasion by a foreign nation. During World War II, the US Government interned at least 11,000 persons of German ancestry. By law, only “enemy aliens” could be interned. However, with governmental approval, their family members frequently joined them in the camps. Many such “voluntarily” interned spouses and children were American citizens. Internment was frequently based upon uncorroborated, hearsay evidence gathered by the FBI and other intelligence agencies. Homes were raided and many ransacked. Fathers, mothers and sometimes both were arrested and disappeared. Sometimes children left after the arrests had to fend for themselves. Some were placed in orphanages. Read more personal stories. The Department of Justice (“DOJ”) instituted very limited due process protections for those arrested. Potential internees were held in custody for weeks in temporary detention centers, such as jails and hospitals, prior to their hearings. Frequently, their families had no idea where they were for weeks. The hearings took place before DOJ-constituted civilian hearing boards. Those arrested were subject to hostile questioning by the local prosecuting US Attorney, who was assisted by the investigating FBI agents. The intimidated, frequently semi-fluent accused had no right to counsel, could not contest the proceedings or question their accusers. Hearing board recommendations were forwarded to the DOJ’s Alien Enemy Control Unit (“AECU”) for a final determination that could take weeks or months. Internees remained in custody nervously awaiting DOJ’s order–unconditional release, parole or internment. Policy dictated that the AECU resolve what it deemed to be questionable hearing board recommendations in favor of internment. Based on AECU recommendations, the Attorney General issued internment orders for the duration of the war. 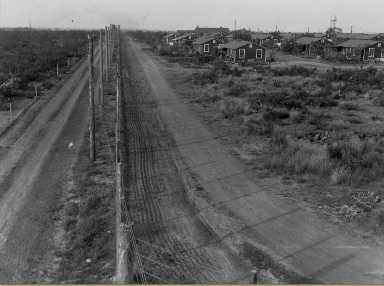 Internees were shipped off to distant camps. Families were torn apart and lives disrupted, many irreparably. Family members left at home were shunned due to fear of the FBI and spite. Newspapers published stories and incriminating lists. Many families lost their homes and had to apply to the government to join spouses in family camps, apply for welfare and/or rely on other family members who could afford to support them. Eventually, under such duress, many internees agreed to repatriate to war-torn Germany to be exchanged with their children for Americans. Ultimately, over 2000 Germans and their families were repatriated and exchanged. Once there, food was scarce, Allied bombs were falling, and their German families could do little to help them. Many regretted their decision. Considering the spurious allegations, which led to the internment of a majority of internees, their treatment by our government was harsh indeed. Their experience provides ample evidence of why our civil liberties are so precious. In cooperation with the War Department, pursuant to the Alien Enemies Act, DOJ created a network of prohibited zones and restricted areas. Enemy aliens were forbidden to enter or remain in certain areas and their movements severely restricted in others. The restrictions imposed great hardship on those living or working in these areas. 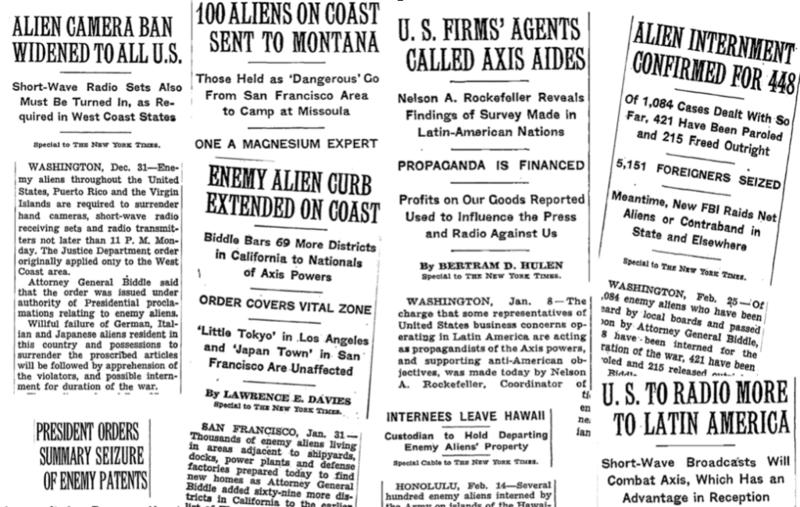 Pursuant to Presidential Executive Order 9066, the military could restrict the liberties of citizens and aliens, as it deemed necessary. This led to the exclusion of individuals and groups from extensive “military zones” comprising over a third of the US. The most well known group exclusion was the massive relocation US citizens and aliens of Japanese ancestry from the West Coast and their subsequent incarceration overseen by the War Relocation Authority. Several hundred individual exclusion orders were issued. The government was particularly suspicious of naturalized citizens of enemy ethnicity. Citizens could not be interned, so the military threatened those it deemed dangerous with exclusion. Many felt contesting exclusion orders was futile and moved before an order was actually issued. Unlike West Coast Japanese group exclusion pursuant to Executive Order 9066, hearings were required for individual exclusions. Resembling enemy alien internment hearings, these hearings were subject to very limited due process protections, clearly violating the rights of American citizens. If an exclusion order was issued following a hearing, excludees were given little time to depart. Homes were abandoned. Some excludees left their families behind. FBI agents followed them to their new communities. The government often advised police and employers how “dangerous” excludees were, so finding and keeping jobs was difficult. Little or government resettlement assistance was given to excludees. Some contested their exclusion orders in court, protesting the government’s violation of their due process rights. After several federal courts found the military’s actions of questionable constitutionality, the individual exclusion program decreased in popularity. Although more unusual, in lieu of exclusion the government also sought to denaturalize citizens, so they could be interned as enemy aliens or deported. Thanks to federal legislation and effective activism by their ethnic group, US government mistreatment of Japanese Americans is well known. After almost 70 years, the German American and Latin American experiences remains buried. The few surviving, aged internees remember their experiences well, despite years of trying to forget. Their memories haunt them. Mostly, because they are Americans who revere freedom, they want the dreadful saga of their wartime mistreatment told so it will never happen again.